With a full array of micro- and macro-nutrients, our unique cold processing quickly stabilizes the fish to retain all the vital components for a fresher, more complete fertilizer. Neptune's Harvest hydrolyzed fish is an organic fertilizer made from fresh North Atlantic fish. It is made by a unique cold process that protects the vitamins, amino acids, enzymes and growth hormones. It also contains all the micro and macro nutrients naturally found in fish. The nitrogen and other nutrients are chelated, so they are readily available for plants consumption. Unlike fish emulsions, Neptune's Harvest's fish hydrolysate retains the natural fish proteins and oils and has no unpleasant odor. 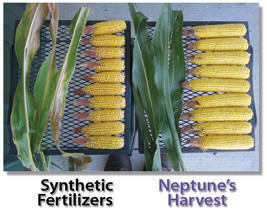 University studies have shown Neptune's Harvest to outperform 20-20-20 chemical fertilizers. What is the Difference Between Fish Hydrolysates and Emulsions? Fish Hydrolysates are the whole of the fish, processed in a gentle manner to preserve all of the valuable proteins, vitamins and other active compounds intact. Fish Emulsions are processed in a manner that removes the valuable proteins and oils from the fish (for sale in the cosmetic, pet food or vitamin industries) then subjects the remaining materials to very intense heat that denatures proteins and concentrates salts. How is Neptune's Harvest Hydrolyzed Fish Different? • Our products contain many more nutrients than Standard N-P-K fertilizers. These additional nutrients address a wider array of deficiencies. • Neptune’s Harvest is made using a unique cold process. 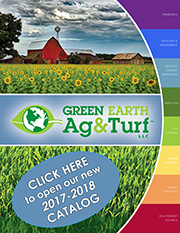 Unlike the destructive heat used to produce other products, this cold processing leaves important proteins, vitamins and other active compounds intact and readily available for plants, trees and turf. • Unlike fish emulsions, we do not remove any of the oils or meals from the fish that are highly valuable for plants, trees and turf. • The organic nitrogen and other nutrients in Neptune’s Harvest fish is naturally chelated. That makes them more bioavailable for plant consumption and they will remain in the soil for a much longer period. • Fish fertilizers are commercially proven to outperform synthetic fertilizers. • Fish fertilizers increase natural sugars (brix) in plants and turf, making them healthier and less susceptible to disease and insect damage. Neptune’s Harvest Hydrolyzed Fish is organic and environmentally-friendly, can be used on all plants, trees and turfs and is safe for pets, animals and children. Use Neptune's Harvest Fish Hydrolysate at a general rate of 2 to 2.5 gallons per acre (6 to 7.5 ounces per 1,000 square feet), 2 to 3 times per year. Neptune's Harvest is a Hydrolysate Made from Rich, Pure North Atlantic Fish.